Painting over die casting parts are needed for aesthetic or durability purposes. Most die cast parts are painted via liquid or powder coating. 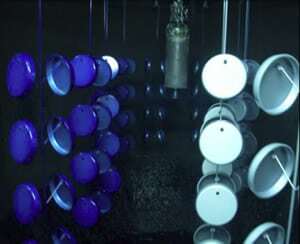 Coating material is atomized to negatively charged electrostatic particles and then sprayed over the die cast parts, which had been made positive electrodes by electrostatic induction. Coating is sprayed over the surface of die cast parts by compressed air. Applying high-voltage direct currents to powder to make it stick to die cast parts via electrostatic attraction, then melting the coating to cover over the surface of the die cast parts by heat in furnace.